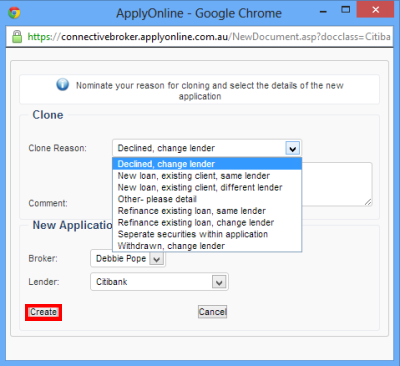 It is possible to clone an Apply Online application if you have entered data into the application within Apply Online, but now want to submit it to a different Lender. 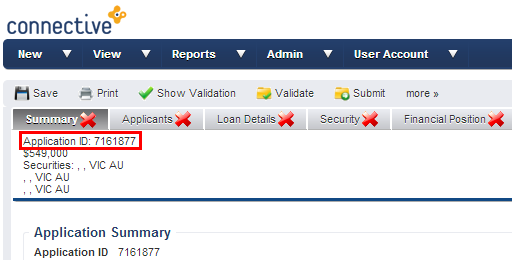 Apply Online sometimes caches old broker codes entered by admin staff, so it is extremely important that admin staff who submit loans for more than one loan writer are vigilant about checking the Broker Code. 3. Select a reason, enter comments if required, and select the Lender (either the same OR different lender). 4. Click Create to create the clone. 5. Your new application will have a new Application ID. 6. For details on how to transfer the new application details back into Mercury, refer to Transferring data to Apply Online, and back to a Mercury Opportunity. If the application was created in Apply Online to begin with, or is a clone, you will notice the Application ID starts with 7*****. Remove the MER number within your Opportunity.